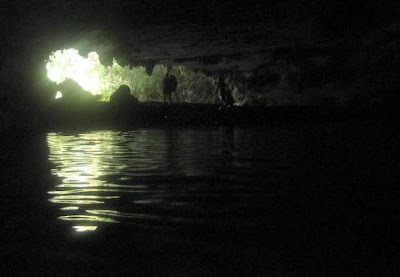 When last we left the Belize Adventure Girls, they were headed out with their fearless guide, Ernesto for an afternoon of Cave Tubing in the Belizean jungle. 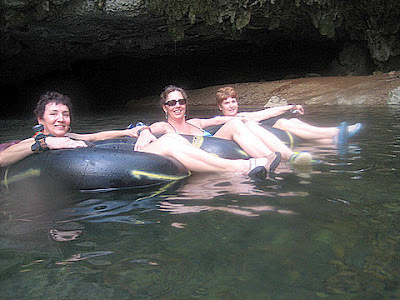 Cave tubing involves floating on a river, through caves carved out by the water. 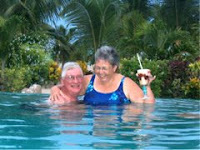 It is one of the most popular tours in the country. After a short drive we arrive at the national park to begin a short (well, about a mile) walk to where we will launch the tubes. You have to be able to walk and carry your own tube for this particular adventure. 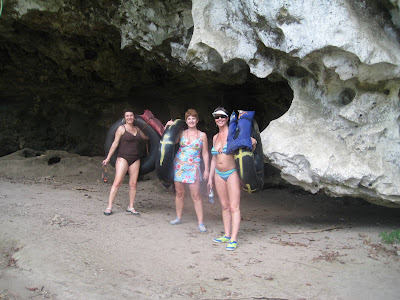 Here we are, Wendy, Betsy and Cindy getting ready to get into the water. Now, the air is about 89 degrees and the water is, well cold. This is basically a mountain stream. 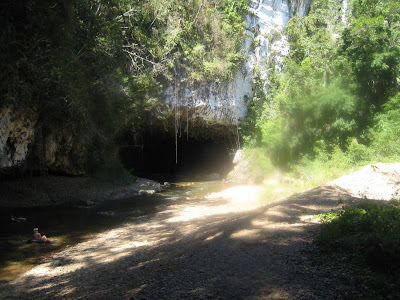 This is the mouth of the cave we will float through. The water is anywhere from 4 inches to 8 feet deep. The water is crystal clear. All cave tubing photos were taken with my new Canon Powershot SD1000 camera in it’s fancy new waterproof case. I highly recommend everyone have a waterproof case for their digital camera. 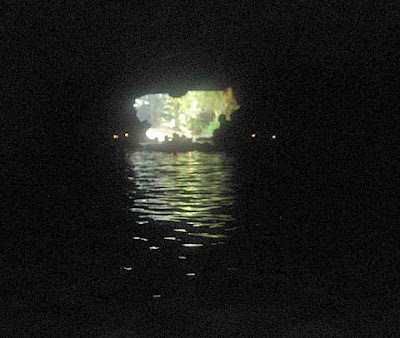 This is a picture of the same mouth of the cave from inside the cave. You’ll notice the people floating behind us are wearing miners lights on their heads. So are we. It is going to get very dark, very soon. After about 20 minutes of viewing stalagtites and stalagmites and other unique formations inside the cave, none of which were adequately captured on film, we see the light at the end of the tunnel. According to Ernesto, pictured here, we are now going to float for about 20 minutes in the sunlight through the jungle. He has already been extremely helpful by guiding us through the cave and yelling “butts up” in the shallow parts. We’re ready to warm up a little in the sun. Ernesto was kind enough to take our picture as we leave the cave behind. You will notice that I no longer have my sunglasses. They are at the bottom of the river. Our next adventure is flying back to Ambergris Caye on the same little plane on which we came The next day…(and the subject of a future blog) we take a bicycle tour of San Pedro.